What ideas could make a more robust ecosystem for creating, sharing and modifying themes? 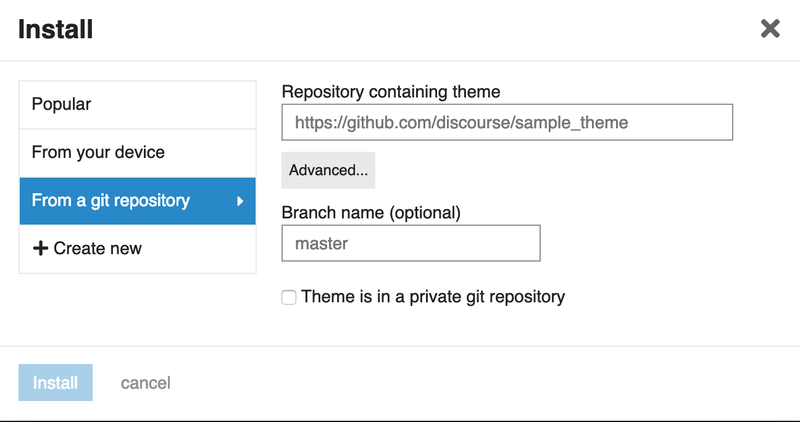 In mid December, @codinghorror started a discussion about Minimal Discourse - a custom theme for discourse developed by @karissa and ange. The discussion was focused around what could be learned from that design so as to improve the default theme that ships with Discourse. @sam then started experimenting with his own Minimal Theme and publicized a hack so that others could load it live on meta to ‘live with it’ (as I have been doing for a number of weeks now) by bookmarking the sticky preview link. To be fair, Sam’s minimal theme goes a long way to illustrate just how configurable things are. But maybe some other things should be easier that go beyond the existing easy styling system. And as @JSey noted, more could be done to improve the ecosystem for authoring and sharing themes. I would really suggest to start including more than one default style with Discourse. Creating the both look with css+html customisations is totally feasible. One other nice alternative would be to create a (wordpress-ish?) theme store/website/place where you can easily browse several styles, the first ones supported by the Discourse team, and hopefully numerous others coming later… The current customisations were all discussed here, but are distributed in several places and pose a major obstacle for new Discourse users. If you have any ideas for how to improve the ability to create, modify or share themes, please post your thoughts below! Where is my The Darkness? a theme selector could already be implemented by a sticky thread with screenshots of the themes and a link with the sticky flag set - put this in the user profile and you have the standard behaviour of all forum systems out there! I would offer help in coding - but currently, I would spend 500% of my time searching for the right strings to pull - plus, I have some other projects for my own forum relaunch (a revised phpBB importer among others) - sorry about that! The biggest pain point I see now is versioning and sharing. I think allowing a customisation to come from a source in github with a simple update button to “get latest / revert to version” would do tons at helping here. We need a clean way for collaborating and sharing themes. Allow admins/mods/tl4 to “pin” style to themselves. Allow site customisations to be flagged as “user selectable” which can be then pinned by users to the actual user. I want to pick my theme and take it everywhere, cutting and pasting is a PITA. 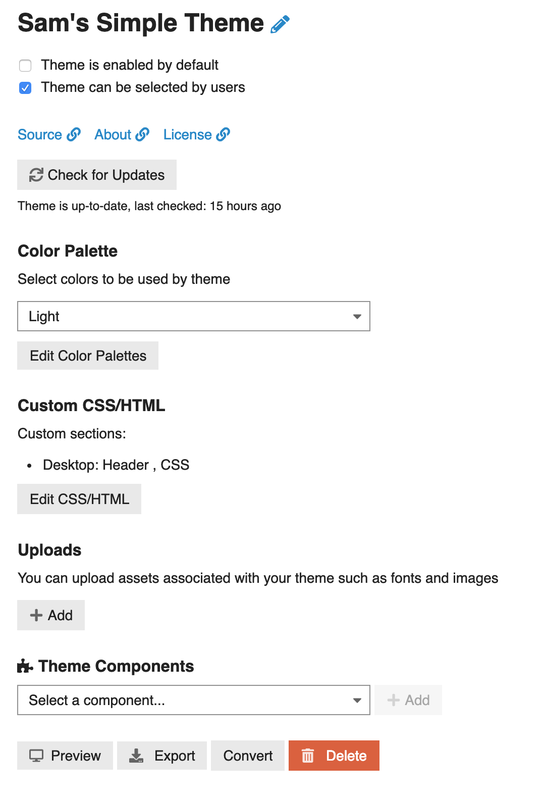 When adding a theme allow people to simply paste in a url, eg: http://meta.discourse.org/themes/22/sams-awesome-theme, the system can then keep track of that theme on an external site and notify admins when it is out of date and may need an update. ShareJS (open a few windows) would be super cool for me. It would also allow users to collaborate on theme creation very cleanly. Overall I feel there are a few small steps we can take that would heavily increase productivity and usefulness of the system. the system can then keep track of that theme on an external site and notify admins when it is out of date and may need an update.